Properties in Lanzarote average 4.6 out of 5 stars. Property 32: Marina Rubicon - Villa 2 Bedroom - Minutes to the Sea Front, Pool, WIFI. 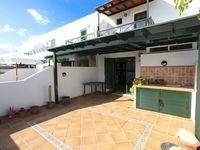 Property 48: Cottage with private pool in Lanzarote. Different experience. Property 50: Apartment With Large Terrace And Lovely View To The Pools And Sundeck. Great Holiday! Damien was very accommodating. Great location! Apmnt needs a little bit of attention but nothing that would spoil a family holiday. We had a lovely time at the apartment...perfect size for 3 people and great to have two bathrooms. The terrace was a little sun trap and perfect for relaxing. The patio furniture does require an upgrade - it was broken and I injured myself on one of the loungers due to it being cracked. We didn&rsquo;t receive any communication about leaving the property so this could be improved as part of the experience. Overall a restful stay and we enjoyed staying here.